An artist's illustration of NASA's planet-hunting Kepler space telescope. The Kepler space telescope isn't dead yet. Kepler, which has discovered about 70 percent of the 3,800 known exoplanets to date, woke up from a four-week hibernation yesterday (Aug. 2) and has begun beaming data home, just as planned, NASA officials announced today (Aug. 3). Kepler had been sleeping in an attempt to save thruster fuel, which is running very low. Mission team members wanted to make sure the spacecraft had enough propellant left to orient its antenna toward Earth for yesterday's data dump. Far-flung NASA spacecraft send information back to mission controllers via the agency's Deep Space Network (DSN), a system of radio dishes around the globe. The sun-orbiting Kepler's latest allotted DSN window opened yesterday, agency officials have said. The $600 million Kepler mission launched in March 2009, tasked with helping determine how common Earth-like planets are throughout the Milky Way galaxy. The spacecraft hunts for alien worlds by noticing the tiny brightness dips caused when the exoplanets cross their host stars' faces from Kepler's perspective. During its original mission, Kepler stared continuously at 150,000 stars, gathering data that would lead to more than 2,300 confirmed exoplanet finds (and counting). These observations ceased in May 2013, when the second of Kepler's four orientation-maintaining reaction wheels failed, robbing the spacecraft of its precise pointing ability. But the mission team figured out a way to stabilize Kepler using sunlight pressure, and in 2014, NASA green-lit an extended mission called K2. During K2, Kepler observes a variety of cosmic phenomena during shifting 80-day "campaigns." Some campaigns involve exoplanet hunts; the K2 alien-world tally currently stands at 323. 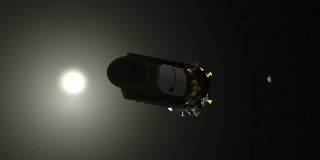 Kepler has completed 18 campaigns to date during its K2 mission phase. Campaign 19 will start Monday (Aug. 6), if enough fuel remains after the current data-delivery work. So stay tuned!